Portraits: British 19th C, Maritime Subjects 14 comments Who painted this early portrait of Arctic explorer Sir John Ross? It has something of Raeburn about it. As the other discussion has already noted, John Hayter is known to have exhibited a portrait of Ross, but that has not yet been pursued. The John Hayter portrait of 'Captain John Ross' was no. 306 in the RA exhibition of 1834. It appears that the portrait by John Hayter of Sir John Ross was bought in 1864 by the Corporation of London for 100 Guineas. There is an interesting account in the 'London Evening Standard' on the 9th Dec. 1864. The article also seems to infer that the portrait had been kept by Hayter in his studio for nearly thirty years until the 1860's. There was a proposal at the Court of Common Council to buy the portrait after it had been displayed in the Guildhall for The Lord Mayors day of 1864. It also notes that the Corporation had contributed 100 Guineas towards Ross' expedition. Felix Booth had also famously fitted out the expedition whilst he was the Sheriff of London. (Although he had originally turned it down), it appears that he may have paid £17,000 and Ross £3,000 from his own purse. The transaction is also recorded in a number of regional Newspapers around the 21st of December that the painting was bought for a 100 Guineas. The Hayter portrait doesn't appear to be in the collection of the Guildhall Gallery as shown on ArtUK, unless it has been a mislaid or donated elsewhere. Are the paintings distributed across various sites or buildings? Did the Corporation of the City of London lose any paintings when the Guildhall was damaged/destroyed in the blitz in 1941? Is there a chance that Archives could be reviewed within the Guildhall Gallery as to what happened to the painting after it came into their possession please? Incidentally, It also looks like there was another portrait of Sir John Ross in the Ross family as there was a miniature on ivory of Sir John Ross by John Hayter, exhibited in 'The Naval, Shipping and Fisheries exhibition of 1905 at Earle's Court, London. This isn't as surprising given that he was the son of Charles Hayter, the miniaturist. The painting of Sir John Ross by Hayter on the other discussion was donated to the Maritime Museum by Arthur V. Ross. He was James Clark Ross' grandson. The Miniature, as well as the flag that was raised at the magnetic pole was lent by Cecil C. Ross Esq. He was also a grandson, but a descendent through James Clark Ross' other son. Can you tell us please what the provenance of the painting above is? It's a little vague on the Collection's website. Thanks. This came from Sir Robert Leicester Harmsworth, 1st bt. (1870-1937), Liberal MP, businessman and one of the four mainly publishing brothers who all became peers (Lords Northcliffe and Rothermere) or baronets: it was sold at Christie's, 18 March 1838, lot 147, where its was bought by Sir James Caird via Spink's for the NMM. This discussion has been linked to the group 'Maritime Subjects'. There havenow been two independent suggestions (from Osmund Bullock in the parallel discussion on the 'other' Greenwich portrait of John Ross, and privately to me by an NMM colleague) that this is probably not John Ross -which is it old received but so-far unqueried identification- but his nephew James Clark Ross. 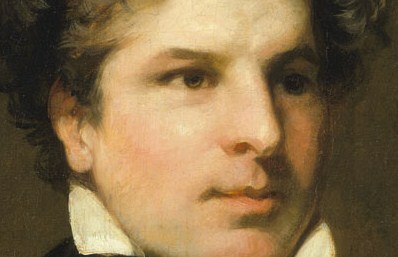 General appearances seem to support it without suggesting who such a good image might be by assuming it shows him between about 1820 and 1835 at latest. J. Beech of London Road, Leicester, showed a 'Captain Ross' at the RA in 1830 (when JC Ross was in fact a Commander in rank, but the terms are informally interchangeable). However his uncle John was then a captain already and both absent on their 1829-33 Arctic expedition, so it Beech's portrait -given he was a provincial painter- might just be another 'Captain Ross', perhaps an army man. 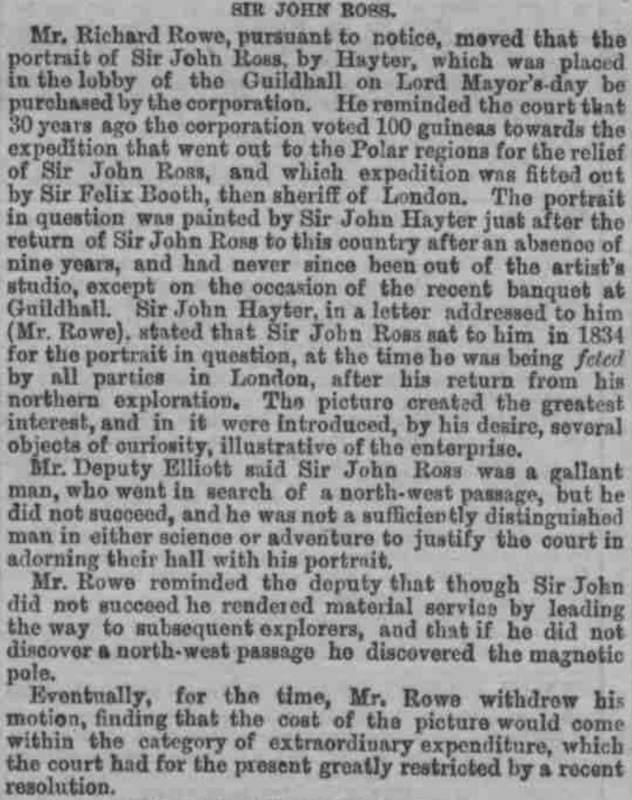 John Hayter showed a now unlocated 'Captain John Ross' at the RA in 1834, after the expedition returned but this is unlikely to be it even if it is John since he was then about 56, let alone other appearances. Beech was in London in 1830s, albeit on a temporary basis. So it is not quite correct to say that he was provincial artist, in the most accepted understanding of that phrase. The other famous Captain Ross in 1830 was Captain Horatio Ross, the marksman, racehorse enthusiast and all round gambling fanatic. Heavens, I was expecting much more resistance to the idea that this might be Clark Ross! And also bracing myself to put together some long and detailed posts with composite images in support - a relief not to have to, as I've a long list of things to write about re Sir John on the other discussion. Actually the thing that kept shouting at me was his extraordinary, top-heavy 'big' hair' - JCR has it thus in all his portraits, while his uncle's style is far less flamboyant throughout. I agree that c.1820-30 is right, and suspect the early part of that range - it's really quite a boyish face, hints of puppy fat, youthful enthusiasm. And no sideburns, of course. The chunky (in shape, anyway) fur wrap is slightly deceptive: it gives him more weight, visually and metaphorically, than the basic portrait; I rather think it was added later, and has since proved more fugitive to over-enthusiastic cleaning - either that or it was unfinished. My guess is that it was added after the 1829-33 expedition, to try and turn a pleasant, lightweight young man's portrait into something more substantial and relevant to his new reputation - or much later for the same reason. I don't think it can be Watson Gordon. It seems too loose, flat and imprecise for him; and there are some poor passages...his left eye (our right) is a mess, too big, too low, and quite dead - surely WG wouldn't have come up with that? Whoever it's by, perhaps it was unfinished and completed by someone else...or damaged and badly restored? See attached close-up. To address E.Jones's post about John Hayter. First, I think you may have misunderstood (or it's a typo)...the portrait of Sir John Ross on the other thread is not by Hayter - at least it seems most unlikely, though it's true that it was described as including "by his [Ross's] desire, several objects of interest, illustrative of the enterprise". To find out exactly who it *is* by is the very purpose of the other discussion! We should probably really be talking about it over there, but as you've raised it here I'll reply here too. Second, I'm pretty sure that Hayter's portrait of Captain (John) Ross, RN (the one that was exhibited at the RA in 1834), was *not* acquired by the City of London for 100 gns in 1864. The Evening Standard report of 9th Dec that you attach (and two similar ones in the London City Press of 10th Dec, and the Galloway Advertiser of the 15th) describing the Court of Common Council's meeting of the 8th Dec to discuss the suggestion, makes clear that there was little or no inclination at the meeting to buy it, and the move to purchase it was withdrawn "for the time" by the proposer for that and financial reasons. The six provincial newspapers (in Hull, Salisbury, Staffordshire, Sheffield and two in Newcastle) that between 17th and 23rd Dec reported in identically-worded (and very brief) terms - you showed us one example - that the portrait had been purchased by the Corporation for the same price were, I believe, mistaken - the result I would imagine of one erroneous story that misunderstood and incorrectly precised the original report of the meeting, and was then repeated by several others. None of those six provincial papers carried the original lengthy story, and no London paper carried the new one. I also find it hard to believe that the man who proposed the motion first time round was able to resubmit it just a week later at another Court of Common Council (if there was one then). If it *was* purchased by the City, then they seem to have got rid of it again pretty quickly: just three years later, on 8th Feb 1868, "a fine portrait of Sir John Ross by Sir [sic] J. Hayter" was offered by Christie's at their rooms at King St in London, one of a "valuable collection of modern pictures..the Property of a Gentleman, received from the Country". See attached advertisement. Quite a number were by Charles, George or John Hayter, suggesting that they may have come from the artist or his family - John Hayter almost entirely stopped exhibiting after 1864, which explains him selling off the contents of his studio thereafter. I should be able to get more details of seller, buyer and (I hope) size from Christie's Archive. Sorry, I misread the advert. The Charles and George Hayter portraits were *of* them, not by them - they, along with others including Ross, were by John. Which makes it even more likely the collection was his, and derived from the contents of his studio. I doubt this sale of 1868 has anything to do with any of the Hayter studio sales (if that is what meant). It is the fairly large collection of "a gentleman". The extent of the works of art listed suggests to me that these are not the collection of John Hayter. However, if it can be proved otherwise, I will be interested to know. You are wise to recommend caution, Barbara, on all counts - especially as I can find no sign that John Hayter moved out of London after his retirement (at least not until the very end of his life many years later). The journalists who reported the 1864 meeting at which the painting was discussed seem to have been even more confused than Christie's about the artist's identity - see attached. I will try and look at a copy of the 1868 catalogue this week, and email Christie's Archive for any further information they hold. This painting shows Sir John Ross in civilian dress wearing a fur-collared cape loosely round his shoulders. The yellow flashes on the left are probably the metal chain fastening. Ross was promoted to Commander in 1812 after considerable service in the Baltic. While a lieutenant in 1809, he became a Knight of the Swedish order of the Sword. He subsequently continued on largely northern and service until leading his first Arctic expedition in 1818. He was only promoted to Captain on his return that December. The fur cloak could allude to any of this, but he is clearly shown as a young man (he would have been 40 in 1817), indicating that this painting was probably painted before 1820.